method of anchoring directly into any substrate, whether permanent or temporary. and pipe work and a host of other uses in-between. Exceptional strength anchors for permanent and temporary applications in all substrates. 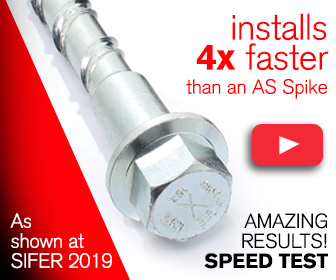 A proven fast and easy, stress-free fixing which saves time and money. Vibration improves tensile performance. High load, stress-free fixings ideal for close to edge applications. Ideal for supporting push/pull props in conjunction with the erection of pre-cast panels. Excalibur Screwbolts have been used in many high security applications including HM Prisons. From fixing light items, such as cable trays, to heavy machinery there's a Screwbolt for practically any application.